This week’s assignment was to investigate social media monitoring tools and explain their value for measuring a social web program. There are many, many monitoring tools out there, both free and paid, and choosing one that meets your company’s needs is going to take some work. But it is work you must do – that is, if you intend to understand whether your social media efforts are making a difference for your company. Why is monitoring and analysis important? 1. 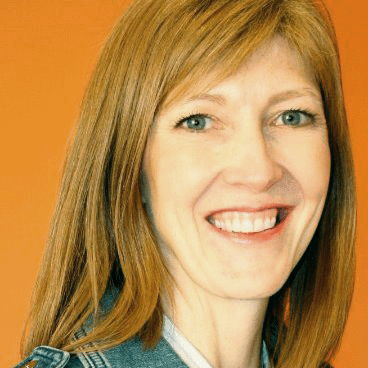 The opportunity to continually improve execution is the main advantage for PR professionals. If we know what’s working, we can move forward. 2. Another major benefit of the better tools on the market is the ability to dig into demographic and geographic information to better understand your audience. As I’ve said before, knowing your audience drives everything in your social media program. The more you know, the better you can use social media to help meet your organization’s goals. 3. Social media moves quickly and can be terribly unforgiving. Insights from paid and free tools will help you stay on top of what’s happening and protect your company’s reputation. Paid services will obviously be more comprehensive and offer greater insights; however, even free tools will provide clues about which messages are getting noticed, on which channels, and whether there is a storm brewing that merits your attention. I looked at Addict-o-matic and Ice Rocket – both free – and ReSearch.ly, a paid service that is integrated into PeopleBrowsr’s Playground platform. I provided scores, which I admit are a bit unfair because they compare apples and oranges. That said, the ratings reflect my view of how well these tools would meet the needs of a PR professional working in corporate communications. I gave Addict-o-matic 4/10 because in my view, it does less than half the job. This free tool gives you an instant snapshot of news, tweets, blogs, videos and other posts mentioning your brand or issue this minute, but it offers nothing in the way of analytics or trends. 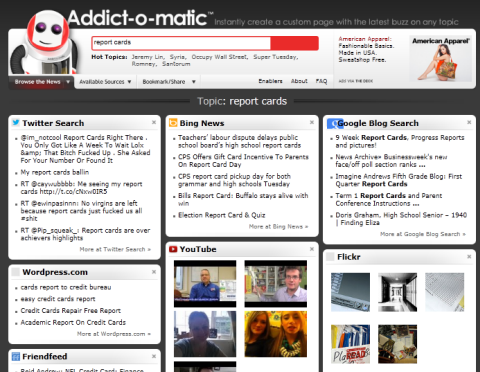 Addict-o-,matic is dead simple and features a clean dashboard for search results. On the plus side, I found Addict-o-matic dead simple to use. It quickly gave me results and categorized them neatly. The search capability is basic. My query turned up a mix of relevant and off-base news and content, but still allowed me to see where conversations were happening. Ice Rocket offers advantages over bare-bones Addict-o-matic. It has been around for a long time, mostly living in the shadow of blog search tool Technorati. Ice Rocket began as a blog search tool and branched out to Twitter, Facebook, images and video more recently. It was acquired by news monitoring service Meltwater Buzz in 2011. Ice Rocket can search multiple social streams but only offers trend reports for blogs. Reports cover up to three months. As far as I can tell, Ice Rocket’s strength still lies in blogs. 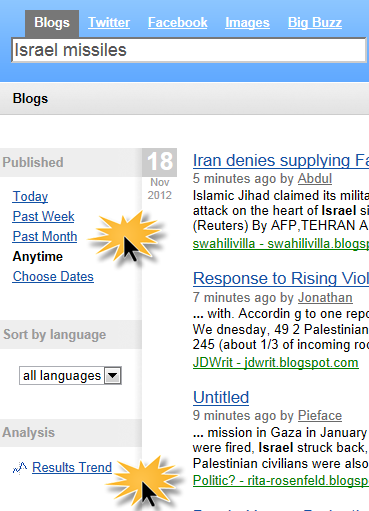 It offers basic analytics, such as trend reports for up to 3 months, for blogs but not other social streams. For this reason, Ice Rocket could complement other free tools in your monitoring kit that tap into Twitter and other hot platforms. The tool has some nice features for Twitter too. It has the ability to trace activity on specific hashtags and links. It also tells you how many tweets are occurring per minute, hour or day, giving you a rough estimate of whether activity is moving up or down if you check it regularly. ReSearch.ly is part of PeopleBrowsr, a social analytics company. It’s difficult to separate the two because Research.ly has a starring role in PeopleBrowsr’s platform. What I can say is that this tool kicks the experience up several notches by allowing you to monitor, analyze and manage engagement with people and communities all in one place. I gave it 7/10 because it appears to have terrific features. But it’s not immediately obvious that it goes beyond Twitter (after more investigation I found out that it does) and it requires a significant time investment to understand how it works. Fortunately, free trials are available. That’s when you realize that ReSearch.ly is integrated into a whole platform that offers major monitoring, analytics and engagement management across the social web. Don’t expect to be an expert after 10 minutes. This tool is complicated and overwhelming; however, my sense is that the time spent understanding it would be worth the effort. I suspect my score would have been higher given more time to investigate. RySearch.ly is primarily a Twitter microscope touting its “1,000 days of data” (the “full firehose” also offered by Sysomos). It uses the data to create an individual’s “Kred”, an influence measure on the giant micro-blogging site. More recently, PeopleBrowsr launched the Playground suite adding more social streams (Facebook, blogs and more, according to its guide) and turning PeopleBrowsr into “a deep social analytics platform designed to be an all-in-one social media solution for the enterprise” says Mashable. Mashable’s story does a good job of parsing the key elements of the Playground suite: Analytics, Search, Engagement and Grid. This platform was built for power users and it is easy to see how agencies would like it. It aggregates content, allows you to slice and dice results, provides quick reports on campaigns, and includes “spaces” to organize social media monitoring and engagement by product or client. Gives insight into which communities are most active with your brands or issues. To demonstrate this feature, PeopleBrowsr’s website provides Pepsi as an example, showing that musicians like Pepsi and talk about Pepsi more than other communities. PeopleBrowsr identifies which communities are most engaged with your product or issue, helping you better target your efforts. You can quickly see whether sentiment is positive or negative and key demographic traits of your audience. It’s international. You can drill down into almost 100 countries and major cities. Covering almost 100 countries and major cities, users can drill into audiences and results by geography. Includes a robust workspace for managing conversations, scheduling posts, assigning tasks to team members, etc., It allows you to work as well as analyze what you’re doing. On the downside, because this tool is so powerful, searches take a long time. It ties up your machine and puts multi-tasking on ice. This may be less of a problem in a corporate environment than for a home user. Overall, it looks like one tool won’t do the trick if you go the free route. Paid services have a lot of offer but will take time to learn and manage to their full potential. Weigh in. What’s your favourite monitoring tool? This entry was posted in Social media monitoring and tagged analysis, measurement, social media monitoring, tools on November 18, 2012 by caroldunsmore. Comprehensive analysis of the tools . . . I’m going to take a deeper look at Ice Rocket personally. Thanks Boyd. Ice Rocket seems to be going through some changes and has shut down certain services. Hopefully, they will stick around for blogs. A great post! You found an interesting cross-section of various monitoring tools, and presented the pros and cons very thoroughly. Your thoughts on Addict-o-matic echo mine completely! Agree that Addict-o-matic is pretty basic, but I like the friendly robot! I saw good stuff on Trackur and Social Mention in your measurement post – thanks for sharing it.